Let’s begin with a plot summary and then get into the review: It starts with a battle in the unspecified Middle East in the 12th century. Nicholas Cage (Gallain) and Hayden Christensen (Jacob) enter the scene wielding really shiny swords. They argue about whether to continue advancing or withdraw, and Christensen pulls rank and decides that they should advance. After Christensen takes down the Middle Eastern leader, the battle apparently ends and the movie jumps to the Far East, three years later. The viewer sees a dying Asian man (maybe an emperor?) who appoints his young son as successor. This elderly gentleman appears to be a ruler but is never referred to as emperor, only king. The boy’s older sister is appointed his guardian and they escape with a monk right before their blood-thirsty warrior older brother bursts in. Older bro accuses the king of appointing the wrong candidate for succession, and throws out most of his posse, the ‘Black Guards.’ Older bro then threatens a guard’s family, pointlessly, and then stabs the king/emperor and kills him. Older bro accuses younger bro of the murder, and sends Black Guards to hunt down younger bro and sister. The siblings all have names, but they’re not easily identifiable or relevant to the plot. The young prince and princess escape thanks to the martial arts skills of the monk who leads them out of the castle, but with no thanks to the flowing white silk cloak on the princess. They ride furiously with the Black Guard in pursuit, until their horse dies of an arrow or exhaustion. The princess leaves her brother hidden-not-hidden behind a tree outside a village, where she enters a tavern to try to find help or a guide or someone older who’s not in the Black Guard…like Christensen’s Jacob! Apparently three years is enough to turn a Crusader into a drunk opium addict but not enough to change his Mohawk-like hairdo. Suddenly the Black Guard burst in, with the young prince as a captive. The guards try to take Christensen’s sword and all the fury of a Crusader trained in martial arts comes forward. The prince and princess are saved, they team up with Christensen and form a merry band and take off across the country side for a far-away city where the prince will be safe and can call up a loyal army. They eventually save/pick up a young girl whose village was raided by Black Guards, there’s a run-in with a mysterious Indian-esque woman in a camel caravan, and they eventually find Cage. Surprise, he’s also in the Far East! He’s gained a crabby wife with healing skills, a taste for wine, and lost an eye. Christensen and Cage rekindle their friendship, and it’s revealed that Cage was a trainer or retainer of some sort for Christensen since he was young. During the last show down with the Black Guard, Cage’s character dies, so does his band of brigands, and his crabby wife. Christensen and the princess apparently die, but then later are seen to be living and accomplishing the goal of putting the rightful heir on the throne. Nicolas and Hayden: At first glance you two seem like quite a pair, however I can’t tell if you’re trying to be British, French, or South African. So which is it? I’ll try to talk my way through some of my other questions below, but this one is really out of my capacity. Accents. So many accents. Why are ex-Crusaders drunk in an unspecified ‘Far East’ location in the 12th century? Viewers are introduced to Hayden Christensen as ‘Jacob’ and Nicolas Cage as ‘Gallain’ during the opening battle, resplendent in chainmail, helmets, gauntlets, scabbards, and the white tunic with the red cross of the Crusades. They argue about whether to advance or retreat, with Cage advocating to retreat and avoid the bloodshed that will follow. Christensen’s Jacob refuses to give up after losing so many men. Cage states that he will withdraw because he’s sick of killing for fat priests, while Jacob pulls off his helmet and chainmail right before the final charge. Good timing, buddy. Got to show off that hairdo’ while the action is hot! Despite his apparent loss of faith in their purpose a few moments prior to the charge, Cage follows along forlornly and watches in a dejected, disapproving way as Christensen leads the Crusaders into a killing spree. The acting in this opening sequence is *almost* the best craft in the whole story, except that the viewer has no context about the men’s relationship or background. I did enjoy the British-sounding “Middle Easterners” or should I call them Saracens? The battle sequence abruptly ends with Cage’s sad eyes in a blood-spattered face, and the plot quickly moves to the Far East. I’ve always wanted to go there! How do ex-Crusaders become martial arts experts? According to the handy-dandy information on IMDB and Wikipedia, director Nick Powell is an experienced stunt double and action choreographer. As a result, I can understand why there is a fight sequence every few minutes. Since we’re in the Far East, it’s only natural that these sequences include martial arts. I am in no way qualified to identify or assess the nature of these arts, only that they were present in the film. Even with my lack of qualification, I was consistently wondering how a three-year binge on alcohol and opium allowed Christensen’s Jacob to become so adept at martial arts! While he is constantly attacked by the seemingly ever-present Black Guards, he manages to (mostly) hold the hordes at bay with a combination of martial arts, sword play, and down-and-out brawling. When Cage’s Gallain is re-introduced, he is also apparently an expert in martial arts. Hayden, did you get jealous of Travis Fimmel and also wanted to rock the anachronistic Mohawk hairstyle on your historical character? I didn’t mind it when the Vikings showed up on screen with shaved heads, since the History Channel had to make some kind of “edgy” costuming decision. However the repeat of this look on Hayden’s Crusader character just looks like an imitation. At least there wasn’t a stereotyped Asiatic dragon tattoo tossed in there somewhere! Nic, WHAT IS GOING ON WITH THE EYE? For most of the film, Cage’s character was “blind” in his right eye. Rather than invest in a patch or make-up artist, apparently the producers and director just thought that Cage should hold it closed in a fluttering, not-quite-closed sort of fashion. This allowed for great consistency between takes, let me assure you (please note the sarcasm inherent in that last line). Nic, WHAT IS GOING ON WITH THE SNAKES? For about 3 minutes of the film, Cage is wearing snakes wrapped around his wrists like they’re the next trend in decorative leather cuffs. He also strokes his own face and other characters’ faces with them. Are we supposed to be frightened? Is Cage in love with them? I can’t even logic my way out of this one without raising more questions. The emphasis of ‘Outcast’ was on stunts, not facts, language, costumes, weapons, geography, chronological timelines, or other elements inherent in a historical fiction plot. The mix of Western and Asian costume elements is frustrating, and not mixed in a logical way. You can almost see zippers on the boots. Here’s a positive note: the cast seemed to be very diverse. Apart from Cage and Christensen, it seems like the casting call asked for anyone who looked remotely Asian and maybe Pacific Islander too. The young boy playing the prince did not remotely resemble the rest of the royal family members and I’m fairly certain I noticed a Samoan or Maori in the cast too. Our Crusading knights only carry swords, yet demonstrate expertise with conveniently at-hand weapons including knives, pikes, bows, arrows, and scythes. There was no sign of chainmail or armor after the opening battle sequence. My favorite fight scene featured Jacob against an untold number of the Black Guards who conveniently approach him in small, manageable groups of 2-5 warriors. The rest just mull around the fighters waving their very Western-style swords in the air. As an equestrian, I noticed that the horses ridden by Hayden and his merry band of fugitives were the same steeds ridden by the Black Guards! This blatant sharing of the production’s resources always rankles me, and signals a lack of attention to detail. 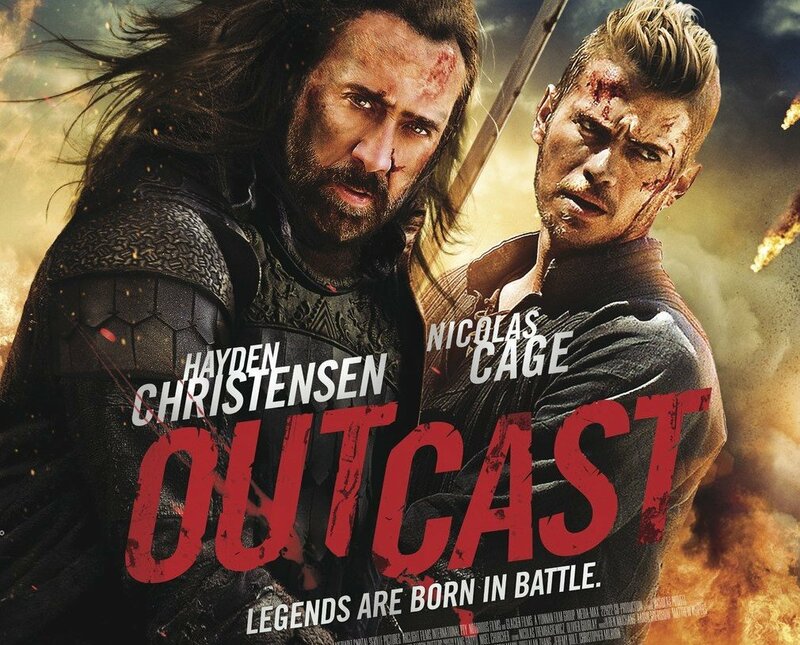 ‘Outcast’ is a strange mix of ‘The Last Samurai,’ ‘Kingdom of Heaven,’ and ‘Mulan.’ I can only imagine what the addition of Tom Cruise and Orlando Bloom as actors, and Eddie Murphy’s voice-over would’ve done for this movie. It will be an eternal mystery. Overall conclusion: Genre of ‘Outcast’ is undiagnosed as drama, action, historical, or comedy. Lots of stunts, bad acting, and inconsistencies. A perfect candidate for a night in with your history nerd friends who also love to heckle, cat-call, and otherwise mock pseudo-historical flicks. Beer or wine suggested, especially if Gallain’s wife doesn’t like you. Danielle Trynoski is the West Coast Correspondent for Medievalists.net, including all things Hollywood!